Flying Soup is the whacked-out story of how a simple video recording turned into an accidental empire, all courtesy of a flying can of tomato soup. When bicyclist and computer nerd Christian Trist and his fellow techno-geek roomies decide they've had enough of the rudeness that cyclists and others encounter on the road, Christian’s near-miss with a can of soup flung from a car window starts the colorful and creative trio of friends off on a mission of revenge – and profit. 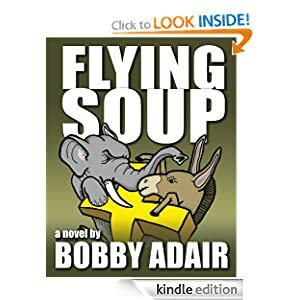 As their dot.com venture, Flying Soup, takes off to record popularity, they find themselves embattled by religious zealots, extremist politicians, gun-toting good 'ole boys and more, with surprising and often hilarious results.